Steven Spielberg proves too accomplished at mimicking the famously clinical, detached Stanley Kubrick style; this sci-fi adventure is stunningly well-designed, technically miraculous, and so emotionally neutral that it rates little more than a shrug. You can enjoy individual sequences tremendously and still find it shallow, just as you can love watching Haley Joel Osment and Jude Law and still feel that the movie's Pinocchio-meets-Orwell storyline isn't shaped, or performed, properly. Still, it's a movie that deserves to be seen, though few did; like many a Kubrick enterprise, it might be more interesting in 10 years than it is now. 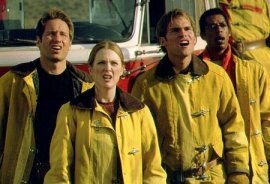 The Dog Days of August: "Rush Hour 2," "The Princess Diaries," and "Original Sin"
I didn't care for the smash hit Rush Hour when it came out in 1998, and so the arrival of Rush Hour 2, needless to say, didn't fill me with excitement. 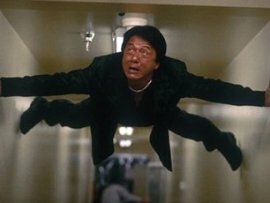 But the prospect of seeing the great John Lone and Crouching Tiger, Hidden Dragon's Zhang Ziyi in supporting roles piqued my interest, and you never know when star Jackie Chan is going to pull off some miraculous stunts, so an open mind seemed appropriate. 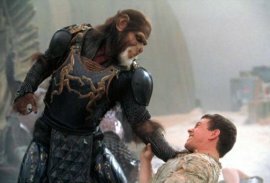 Take the Ride to a New "Planet": "Planet of the Apes" and "America's Sweethearts"
My guess is that Tim Burton's "re-imagining" of Planet of the Apes will meet the same fate as 1999's The Blair Witch Project and last year's X-Men: It'll stand as the most misunderstood, and least appreciated, blockbuster of the summer. 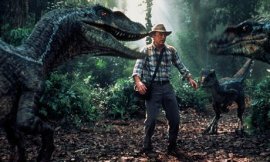 Second Dino-Sequel Nearly Stomps Its Predecessors: "Jurassic Park III" and "Legally Blonde"
Jurassic Park III could have been good. Strike that - it could have been very, very good. There are ideas, gags, and individual set-pieces in director Joe Johnston's sequel that match anything Steven Spielberg came up with in the first two installments of the Jurassic Park series, and it features one running joke involving a cell phone that is sheer perfection. The effects are impressive, the cast is fine, and the movie clocks in at 90 minutes, and who on earth wouldn't be thrilled by that? "The Score" Hits Its Mark Amid Summer Dregs: Also, "Final Fantasy: The Spirits Within," "Kiss of the Dragon," and "Cats & Dogs"
I can't imagine who could make sense of the gobbledygook plotting of Final Fantasy: The Spirits Within, yet I can't imagine who will fail to be wowed by the movie's effects; it might be the most visually extraordinary, intellectually banal sci-fi work since 2001: A Space Odyssey. 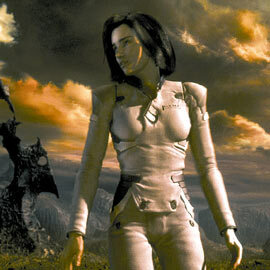 There isn't a moment in the film that isn't amazing to watch, and that includes the moments when the heroine (voiced by Ming-Na) simply walks alone with her hair blowing lightly past her cheeks; Final Fantasy stands as the current standard-bearer in computerized realism. "Baby Boy" Shows Singleton All Grown Up: Also, "crazy/beautiful" and "Scary Movie 2"
It's a small movie, but the scope of John Singleton's Baby Boy is enormous; the film is nothing less than a critique of young African-American males, a warts-and-all look at the infantilization of those who consider themselves true men. Singleton received great acclaim a decade ago for his writing/directing debut, Boyz N the Hood, and while his take on Shaft last summer was an enjoyably over-the-top romp, Baby Boy is his first work to make good on the promise he showed in 1991: The movie is superb. Where nearly every scene in Boyz N the Hood was filled with dread and the threat of violence, the images in Baby Boy are steeped in sadness and resignation, with exquisite moments of joy, fear, and strength throughout. After all the months of secrecy, of waiting, of wondering, we can finally analyze Steven Spielberg's A.I. : Artificial Intelligence. And "analyze" is the appropriate term, because this is a movie for your brain rather than your heart. Those of us who were leery about how the sensibilities of warm, huggy Spielberg would gel with those of icy, cynical Stanley Kubrick (who initiated the project) might be in for a shock; for much of the film, Spielberg mimics the famously clinical, detached Kubrickian style flawlessly. In fact, he's almost too good at it; when actual emotion is called for, the movie falters. A.I. is never less than riveting, stunningly well-designed, and technically miraculous. But I'm still not sure that it's a success. 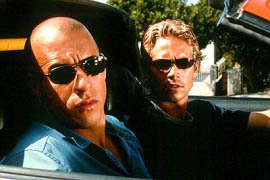 Movie Makes "Mindless Action Spectacle" a Compliment: "The Fast & the Furious" and "Dr. Dolittle 2"
In The Fast & The Furious, that stolid, basso profundo actor Vin Diesel is forced into a close friendship with the blond, pretty, incredibly bland Paul Walker, so you know immediately that you're in make-believe territory once again. Incoherence Rules Summer Screens: "Swordfish," "Atlantis: The Lost Empire," and "Lara Croft, Tomb Raider"
"Evolution" Could Have Used Some: Also, "The Animal"
The sci-fi comedy Evolution is like Ghostbusters without Bill Murray, which isn't surprising since both films were directed by Ivan Reitman, but it also means that it's like Ghostbusters without the big laughs. In that 1984 blockbuster, Murray delivered his lines with an italicized innuendo that made even his throwaway quips hilarious; without his presence, the film (and its underrated 1989 follow-up) would just have been a moderately pleasant, cheesy, overscaled, haphazardly paced affair. That's Evolution.